Apple has already made big changes to how we buy things, now that it’s possible to use Apple Pay to check out with a flick of the wrist or a press of a button. And Apple Pay has significant competition, with Google and Samsung promoting their own mobile payment systems, so many transactions that used to require plastic and signatures are now virtual. Apple Pay alone is on track to process 10 billion transactions this year. Apple’s recent announcement of the new Apple Card service may at first blush seem like just another added feature—now Apple Pay can have a line of credit. But it’s possible that this will impact the credit card industry almost as profoundly as how Netflix affected Blockbuster when it started sending DVDs in red envelopes. Apple Card is a credit card that lives in your Wallet app, supplemented by an unusual physical card. The application process will be built into the app when Apple Card becomes available in the United States sometime in the middle of 2019—no mention was made of other countries. Apple Card accounts work only for individuals; multiple cards aren’t supported. Apple Card uses two different methods of payment, Apple Pay and the Mastercard network. As with current Apple Pay transactions, there’s no permanent number associated with your account, and therefore no number printed on the physical card—the Wallet app generates a unique number for every transaction, which happens behind the scenes. For Mastercard transactions—which you’ll use whenever purchasing from a vendor that doesn’t take Apple Pay—a tap on the card in Wallet brings up your card number, expiration date, and CVV security number. These are assigned when you open the account, but for security purposes, you can recycle those numbers and get issued new ones at any time, right in Wallet. You’ll need the physical card only when making purchases in person at vendors that don’t accept Apple Pay—the card has both a chip and a magnetic stripe. Left unclear is how the magnetic stripe works when you can change the number virtually. Historically this would require writing the new number to the magnetic strip, but perhaps some networking magic pulls the latest number from Apple Pay at the time of purchase. 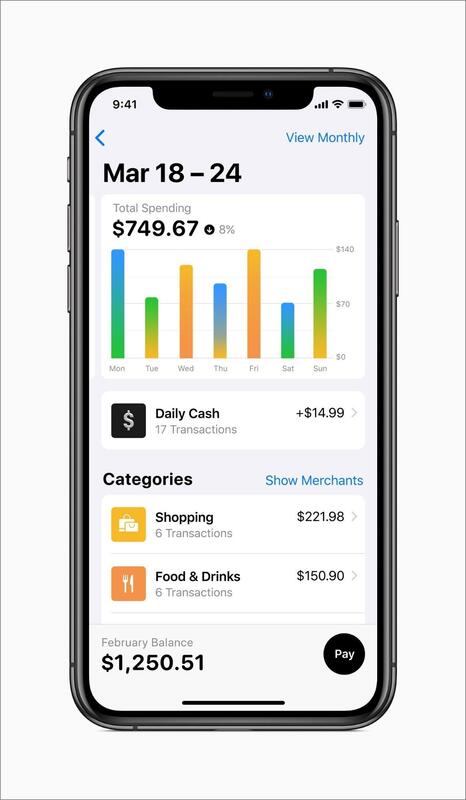 Bring up your Apple Card account in Wallet, and you’ll see the kind of data you’d expect from a credit card Web site, combined with financial analysis and presented with Apple design. The launch screen shows you your balance and available credit, a thumbnail chart of your recent purchases, and a reminder of when the next payment is due. All your purchases are automatically categorized (it’s unclear if you’ll be able to set your own) for grouping in multi-colored graphs so you can see what you’ve spent on restaurants or car expenses. The report also automatically includes weekly and monthly charts and summaries. It’s at the transaction level that the Apple Card interface has some real wow factor: pull up your transactions, and each one will be clearly described instead of showing the incomprehensible abbreviations that sometimes appear on statements. It even shows logos for known vendors. Tap a transaction, and a map comes up showing you where you made the purchase—good for a reminder of what you purchased, or evidence to dispute a charge. Behind the pretty pictures, Apple Card’s financial features are quite different from what you may be used to. During the presentation, Apple said that there are no fees, period: no annual fees, no late fees, no cash advance fees, no over-limit fees. Plus, Apple said, and this is worth quoting, “our goal is to provide interest rates that are among the lowest in the industry.” Even if you miss a payment, your interest rate won’t go up. 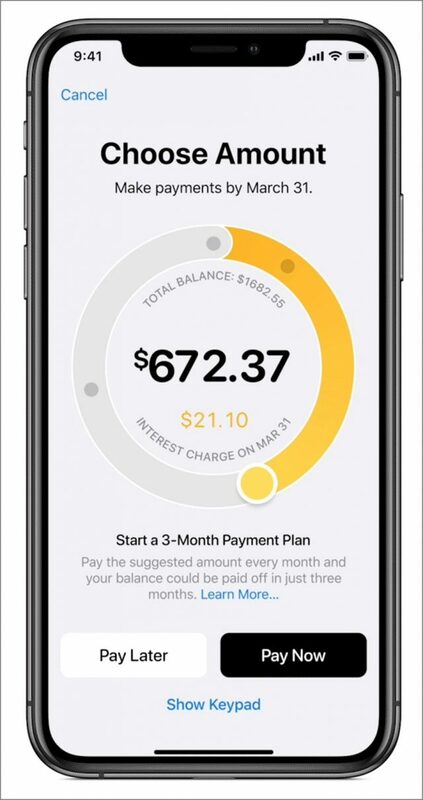 When you make a payment, which you do through the Wallet app, you can use a calculator that lets you set a payment less than the full amount, and shows you what the resulting interest charge will be. Obviously, it’s zero if you pay the full amount every month, but otherwise, you’ll know precisely what you’re being charged to carry over debt. The slider includes suggested amounts to pay: carry a large balance and the circle is red, pay a decent chunk and it shifts to yellow, or pay most or all of it for green. You’ll always know when the payment is due: it’s the last day of the month, for everyone. The Wallet app will also provide “smart payment suggestions” meant to help you lower your interest charges or manage your money better, such as setting up multiple monthly payments timed to your paychecks. Wallet will prompt you that more frequent payments will lower your interest charges—which implies that interest accrues daily since the more standard monthly accrual method doesn’t lower the interest you’ll owe if you pay a week early. Instead of points, rewards, or other incentive programs, Apple Card offers cash back—same-day cash back, called Daily Cash. You’ll be credited 3% for purchases with Apple (including the App Store), 2% for other Apple Pay transactions, and 1% when using Mastercard. You can apply Daily Cash to the card balance, use it for any other purpose within Apple Pay, or send to a bank account, and there’s no upper limit on how much you can receive. Fraud protection is built in by sending you a notification whenever a charge is made, which is commonplace with other credit card apps. But other apps don’t give you a button to tell Apple the charge was unauthorized—Apple claims it’ll then take care of it without bothering you further—and most don’t offer a live 24/7 text chat in Messages you can drop into for any other problems. (Those who do don’t offer Apple’s no-wait promise.) It seems likely that Apple is leveraging the still-in-beta-since-iOS-11.3 Business Chat service. The prominence of the chat suggests that if you prefer to get a human being on the phone, well, good luck. Their other major security feature is mind-blowing: much as Apple can’t read your iMessage conversations in real-time, the company says that it knows nothing about your transactions, their size, location, or any other metadata. That’s all handled by Apple Card’s banking partner, Goldman Sachs. The Wallet app stores all of this information locally to make graphs and show you the details you want. Apple hasn’t said whether you’ll be able to delete locally stored transaction data for security purposes, but the only way to get to it or any purchase capability is with Touch ID or Face ID. What Apple has done here is create a purchasing platform where Apple itself isn’t part of the loop. Most likely, this is done with end-to-end encryption from Goldman Sachs servers through Apple to your iOS device. Apple is warranting that Goldman will use your transactional data only for account purposes and will never share or sell it to third parties. That’s a sweeping statement for one corporate partner to make on behalf of another and puts Apple on the hook both for Goldman’s deliberate actions and for any errors or attacks that disclose data. 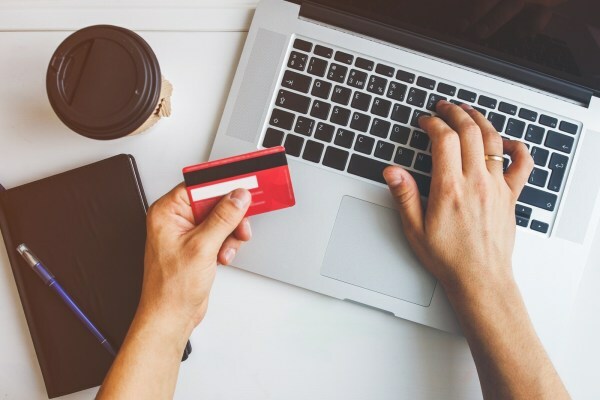 It’s a shockingly user-friendly move in the context of the credit card industry, as is giving up the rich data mine of information that these transactions create. Beyond that, the engineering commitment necessary to present the data Wallet has to process, in a way that exposes none of it to Apple, is stunning for a dozen technical reasons. The privacy promises Apple is making required massive effort, indicating that this is a true company value rather than a marketing maneuver. In fact, scratch the surface, and there’s quite a lot that’s stunning about these Apple Card policies. What appear to be a few user-friendly features could have massive ramifications. One key thing to understand about financial technology is that the tools we use affect the purchases we make. If you pay with your watch versus pulling out a card, you’ll buy different things—more accurately, you’ll buy more things because you’re bypassing psychological barriers involved with cash and plastic. There’s a reason Amazon patented one-click purchasing. Likewise, the data you have affects your behavior. How long do you spend deciding whether to make a $500 purchase and is that more time than it took you to add a $500 option to a $40,000 car? The price of the car inclines you to think differently about the $500—especially if it becomes less of a blip in a monthly payment. This effect is called priming. The credit card industry is geared around getting you to pay more and to never be quite clear on how much more. Say you buy a $600 item because it’s on sale for $500, and you use a credit card because it’s outside your immediate budget. That amount might cost you $10 in interest each month—carry that balance for a year, and that sale purchase was silly. The $100 came out of the retailer’s pocket and went to the bank (with a little extra), so the bank doesn’t want you to think of it as an added cost for that purchase. It’s just a fee. Meanwhile, you “saved $100” and are inclined by this thinking to do so again in the future. If you know the basics of personal financial management, you know that this kind of thinking is not merely irrational, it’s dangerous—the slippery slope to crushing debt loads. But this isn’t about rationality. The psychological effects that the credit card industry triggers are hardwired—chimpanzees in primate labs demonstrate the same irrational financial behaviors we do (substituting grapes and sugar water for folding money). Apple is upending this by dropping all fees and by telling you precisely what it will cost you to underpay your balance. Having that information primes you to make different choices—you’ll know from the slider and suggested payment plans that $500 out of the budget this month is an extra $10 next month, and that same $10 every month until you pay it off. Consumer advocates have been fighting to force credit issuers to provide this information for years, but the best they’ve been able to get out of regulators are those 40-page pamphlets that no one reads. Their biggest victory to date has been the summary box on every application and acceptance letter. Like an FDA ingredient label on food, it boils down the most salient costs of the card. But a consumer needs non-trivial math skills to understand this information—if your card has a 24.9% interest rate and a late fee of $25, how much interest will be added and what will your balance be in 3 months if you pay off half your balance? This involves compound interest—even math whizzes usually need a spreadsheet to calculate it. Apple Card brings those skills to the masses. This difference is crucial. Earlier, I introduced good credit practices by saying, “if you know the basics of personal finance management.” The fact is, very few people do. We routinely use credit instruments where calculating interest requires a spreadsheet and knowing how and when to raise a decimal to the twelfth power, in a country that routinely prints a suggested 20% tip calculation on restaurant receipts because people don’t know it means “divide by 5.” It’s not an overstatement to say that some credit card issuers prey on their customers’ ignorance and exploit normal but irrational human behaviors. 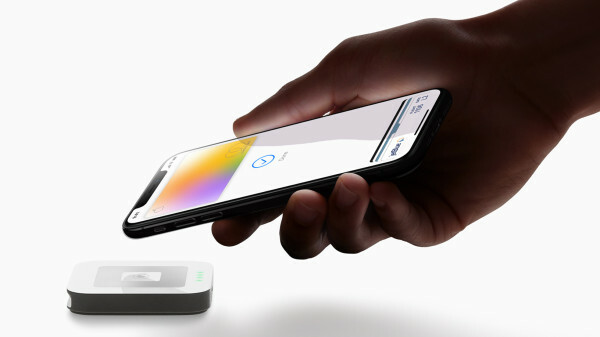 Apple turns this upside down: Apple Card and Wallet subtly teach you about credit and create virtuous feedback loops that likely improve your behaviors on an unconscious level. It’s the same priming, but on the side of the angels for the first time. Once Apple starts doing this, the question for every other credit card issuer in the country will become, “Why don’t you?” And because this is part of a free-market competition between private companies, those in favor of minimal regulation of the financial industry can do nothing about it—Apple has moved it from a political issue to a consumer feature. Apple gets to look extremely generous with its Apple Card fee structure. It’s a compelling argument to switch from more expensive cards with complicated reward structures to no fees and daily cash back. So one might ask—why? Does Apple hate money? The answer involves some psychology and some microeconomics. Credit card issuers usually want to find the right customers. Customers who carry no debt are potentially money losers, eating the cost of the rewards and paying no interest, which is why high-reward cards have annual fees. Customers who carry a lot of debt run up huge interest, which is great for the issuers… unless those people go bankrupt. It’s no longer possible to walk away from debt via bankruptcy the way you once could, but credit card issuers still get pennies on the dollar. The sweet spot, toward which these companies herd their customers, is where the credit card issuers are extracting as much profit as possible without pushing too many customers into bankruptcy and turning future revenue into written-off unpaid debt. That’s why there are due dates, minimum payments, and late fees—they ensure a regular flow of income from even the biggest debtors because they are incentivized to avoid more fees. Here is where Apple gets to exercise its power in an interesting way: miss a normal credit card payment and it costs you money, but miss an Apple Card payment and every Apple device you own might degrade in service. Just as failing to pay for iCloud prevents any new uploads to your paid iCloud storage, Apple could deter you from going into arrears on Apple Card by affecting everything you do with an Apple ID. If you’re paying for other Apple services, you might also lose access to Apple Music, be unable to purchase new apps, or have problems using apps that require ongoing subscriptions. Now consider the free services Apple provides, such as iCloud password and calendar syncing, which could also be suspended at the same time or at a later date for customers who still haven’t paid. Apple doesn’t need your late fees. Apple could apply pressure in other ways to make sure Apple Card is the first card you pay. Does Apple Really Intend to Lower Interest? I am more skeptical about Apple’s claims that it wants to be generous regarding interest. The business of lending money is all about interest. Goldman Sachs isn’t interested in a partnership with a charity. Part of the answer lies in the unannounced details of what merchants will pay. When you buy something with a credit card, the merchant typically pays 2–3% to the credit card issuer. (That cost is generally built into the overall price of the purchase; it’s why gas stations advertise separate cash and credit prices.) Another smaller deduction is made for the credit card processor—for example, CNN reports that Apple currently makes under 1 cent for each Apple Pay transaction. Multiply by 10 billion transactions, and that’s some nice money. But it’s nothing compared to a percentage of the transaction. Apple is still the processor of payments that take place over Apple Pay, but it also has a relationship with Goldman Sachs for Apple Card charges. Financial news coverage is saying Apple will now share in the issuer fees that Goldman Sachs receives from the merchant, and maybe other revenue. Let’s assume Apple will make a 1% profit after shouldering business costs and its share of the 2% rebate to cardholders. The average credit card charge in the US is $93, which means Apple makes less than 1 cent on Apple Pay, but 93 cents for whatever fraction of 10 billion transactions end up being paid through Apple Card. That’s a strong incentive for Apple to sign up as many customers as it can safely manage. Apple could have gone a different path. Apple Card is issued by Goldman Sachs, but not in New York City. It’s issued by the Goldman Sachs branch in Salt Lake City, Utah. Like Delaware and South Dakota, Utah is particularly friendly to credit card issuers, and by locating their consumer credit arm there, Goldman and Apple can charge higher rates and enjoy less-restrictive regulation than would be the case in New York or California. That location likely predated Goldman’s conversations with Apple, but given the tight integration that must be taking place in this partnership, Apple could have forced a new location and made a binding promise about Apple Card’s rates by issuing cards in a state that caps at a lower ceiling. Draw your own conclusions as to why this did not happen. It’s one of the few things about Apple Card that’s just like every other credit card. One last thing is striking about the sum total of Apple’s announcements, and it has little to do with financial matters. Recently, Senator Elizabeth Warren made headlines by talking about bringing antitrust charges against big tech companies, including Apple. This led to a lot of uninformed comments about how such breakups could never happen. That’s historically inaccurate. Both Standard Oil and AT&T in its “Ma Bell” days were far more integrated and centrally crucial to the American economy than Apple, Amazon, Facebook, and Google are today, and the federal government broke up both. The current political climate is different, but those who think it couldn’t happen again should read the writings of people who said it would never happen to AT&T. There is no way of knowing how successful Elizabeth Warren will be in her presidential bid, of course, but she’s also a senator, and now that she’s put the idea of breaking up Big Tech into the political marketplace, others are likely to take up the idea or propose parallel options. That doesn’t mean that such a thing will occur, but it does suggest that the concern is not going away, and that in turn puts public pressure on corporate shoulders. In several ways, the Apple Card announcement paints a much larger target on the company’s back. There are solid technical and business reasons why it’s consumer-friendly for Apple to sell iPhones, run the App Store, and ship iOS apps independent of what’s part of iOS. That’s a case Apple could do well with in court. But when Apple runs the bank that you use to pay for Apple products or uses its control of Apple Pay to set pricing for Apple Card transactions, that’s when it starts to look like an oil company controlling everything from the well to the refinery to the gas station. Apple is also proposing to sell you TV hardware, connect you to TV providers, and subscribe you to its own TV content—this is already drawing attention, and there’s no technical argument against breaking up such business integration. Combine this, however, with what I said earlier: the consumer-friendly processes Apple is introducing, without any government intervention, have been a goal of Elizabeth Warren’s side of the political spectrum forever. 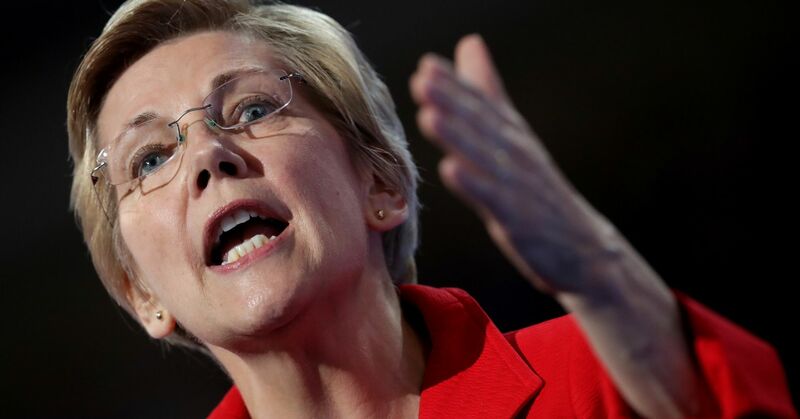 (And specifically for Warren, who came to politics after becoming known as an economics professor promoting such ideas—she’s the woman behind the creation of the Consumer Financial Protection Bureau.) What Apple announced is a win for consumer advocates, on par with how environmentalists would feel about Exxon Mobil announcing that it would start closing gas stations to replace them with wind power for electric vehicles. It’s fascinating that just as the American political spectrum is widening in both directions to include discussions of previously “impossible” ideas—and other major markets like the European Union and China undergo their own chaotic political and economic changes—Apple announces that it’s getting into the financial world in a big way. Just as the iPhone blew away every mobile phone with a keyboard, I believe that the Apple Card could mark a similar turning point for consumer finance. First for what customers expect from their financial service providers, second for government action driven by those changes, and finally for the corporations themselves. The more people who use Apple Card, the faster these changes could occur. Warren said she worries about the financial security of working and middle class Americans, who she says have not enjoyed the spoils of a stronger economy. The 2% discount (3% on Apple purchases) and daily reward of such will atrract a non trivial number of people. I have a Costco Citi card that gives me 2% on anything I buy from Apple PLUS extends the Apple warranty by 2 years up to a total of 4 or 5 years. And I have some other travel rewards cards that net out to 4% or 5% returns plus add a year of warranty if I like my discounts in terms of miles and points. I might get it but I’d need to see more details about exactly what benefits I’d get. For a global player like Apple, and in line with the “no fees” emphasis, I would expect “no fees” also means no foreign transaction fee. 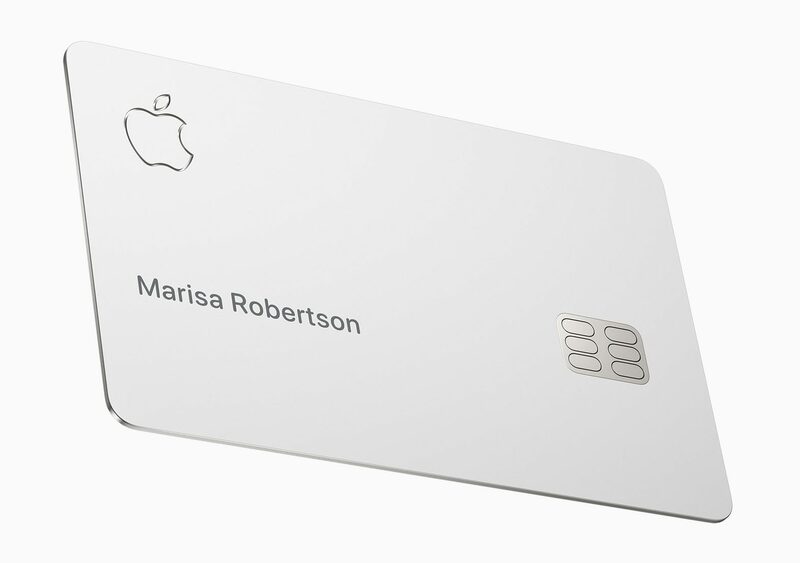 If so, this would be another place where the Apple Card stands out. In my experience, most “no annual fee” cards have a foreign transaction fee. Apple did say no foreign transaction fees, which is pretty unusual. That is another benefit of the Costco Citi card, though. That also has no foreign transaction fees for Costco members. I would guess that the main attractions of the Apple Card are the visibility and definition of charges and location of charge within the app, and the lack of late fees and interest rate penalties for people who have a tendency to be less reliable about paying bills on time. Apple said their card has no foreign transaction fees. But I saw some website zoomed in on the slide showing their example statement and one of the items was a foreign transaction fee! My Chase Amazon card has no foreign transaction fees. I used that in Europe last fall and it saved me hundreds of dollars my other card would have charged me. Those fees really add up when you’re traveling! I remember seeing the same posting. However, the site later noted that the picture was of the statement for the non-Apple Card; the Apple Card statement showed no fee. Is the periodicity of a statement still monthly? Will the transactions be easily exportable on a statement basis to a financial program (i.e. downloadble in .qfx format)? Apple has said that monthly bills will be due at the end of a month. But what is the statement closing date? How many days of no-interest grace will be provided between the closing date and due date ((i.e. the grace period). For most credit card providers, it’s between 21 and 28 days. The market for streaming entertainment services in the highly regulated Chinese market is growing rapidly, and though Netflix tried to negotiate deals, nothing has happened. And although internet service currently tends to be slow and spotty in many areas, China is pushing ahead with 5G. Apple Music is already available there, and Apple’s manufacturing presence is important to China’s economy, so they might have a better shot than Netflix. And although Netflix has been hugely successful in Mexico, Brazil, India, etc., Apple has a good chance in other emerging markets too. News+ also has great international potential. Condé Nast, one of the founders of Texture, publishes editions Vogue, GQ, Wired, Traveller, Architectural Digest, New Yorker, Glamour and more across the globe, including in China. Another Texture founder, Hearst, publishes Cosmopolitan, Elle, Esquire, Harper’s Bazaar, etc., is also a major presence across the globe, not to mention other publishers. An international roll out of Apple’s new credit card would be a great boost to the sale of hardware and subscription services, in addition to the revenue it would generate in and of itself. I’d get one just for the much better security and privacy from merchant tracking if there were no other considerations. Goldman Sachs? Really Apple, was climbing in with such a sleaze ball the best you could do? More importantly though is something that I never see mentioned in ‘getting a new card’ discussions: It can cost hundreds of bucks from increased insurance rates. Insurance companies claim that getting a new card is a red flag that you’re going to commit fraud or abscond, and they convict and penalize you in advance of any actual crime because they’re allowed to. When I got my credit union card so I could ditch my Chase card, I ended up paying over $300 in increased home insurance rates over several years. I only knew because WA state requires disclosure, and because I read the home insurance fine print. That was about ten years ago, but with less regulation these days it could be even worse now. Insurance companies claim that getting a new card is a red flag that you’re going to commit fraud or abscond, and they convict and penalize you in advance of any actual crime because they’re allowed to. When I got my credit union card so I could ditch my Chase card, I ended up paying over $300 in increased home insurance rates over several years. Odd. Haven’t heard of this one. My daughter and I do a lot of CC spending to get points. We both have over 20 open cards each in our families. And our insurance didn’t change once we started this. Now if you only have a few cards without much of a limit and spend up to the limit that can really ding your credit score. A big factor in your score is how much you typically have ourstanding in relation to your total limit. And I suspect that a lower credit score can cause your to pay more for insurance. Anyway compared to the cards I have and that are available (and your goals) the Apple card appears to not be bad, just not all that great. Here’s a good overview of the Apple card and others and why you might pick each. How does Apple Card stack up against other cards that cost you zilch to hold? It can depend on state laws. WA allows the surcharge aka theft, but requires disclosure. Other states may have different rules. It could also depend on their algorithms. If someone has a years long habit of getting new cards, it might lower the risk score. I’m pretty sure that I have a dreadful overall credit score, because I don’t normally buy all that much, I pay in full every month, and have no debt of any kind. Only the credit union makes any money off of me at all, because they get to use the money in my accounts. Financial people hate people like me. Which is fine since the feeling is mutual. These links are from a site I frequent called “The Points Guy”. There are dozens of others. “One Mile At A Time” is another I like. I’m travel oriented so I tend to follow sites that deal with travel things. Many Americans are making some big missteps when it comes to calculating their credit scores. Are you one of them? As the new year kicks off, it's time to check in on your credit score. Follow these helpful tips to get 2019 started on the right foot. Many of Amex's best rewards cards are charge cards rather than credit cards. Learn about the implications for your credit score and credit utilization ratio. Thanks for those pointers to articles from The Points Guy, David Ross. I do wish the articles had publication dates though. At least one of them seemed to have information that was out of date. There are two questions that I have not seen clearly answered. First, what is an Apple purchase? Is that something that has the Apple logo on it or a service from Apple? Or would it include anything purchased from an Apple store, even if it was not a Apple product? Second, does the store matter for purchasing an Apple product? I’m wondering both about other Apple Stores (for example, Apple Store for Education) and other retailers that sell Apple products. And would a non-Apple product from the Apple Store for Education be the same as the same non-Apple product from the Apple Store? Would brick-and-mortar be the same as on-line? I assume that Goldman Sachs would have some mechanism such that the customer could automate payment-in-full each months. Leads to reply 1 to Dana Schwartz: it really can’t be overestimated how much goodwill this will generate among consumer advocates, including presumably Warren. For as long as I’ve been aware of these groups, they’ve always focused on government regulation because it was simply a given that no corporation would ever unilaterally do this. As for Goldman Sachs—I’m told that when they launched their consumer credit, most of their customers were extremely wealthy people who used Goldman as their investment bank. I.e., “I have $500 million under management with them, so it’s convenient to have a checking account and credit card.” The consumer bank and the investment bank are separate by law, so in theory your opinion of the investment bank should be as well. (In practice, a corporate culture could cross over, but in my anecdotal secondhand experience from Wharton friends, the two groups don’t socialize.) I can see why Goldman retail would see this as a way to diversify their customer base in a big way. David Ross: analysis I read today mentioned something I should have twigged to, that the cash back reward is likely to be available for the first time to borrowers who don’t usually qualify for rewards cards. The story estimated that 2/3rds of Americans will likely qualify based on the interest rates mentioned—and if Apple is telling the truth, a higher percentage because they’ll offer 24% rates to the 25-28% group as well. Will M and others: I fully expect that one month after the Card is out, we’ll see a flood of tweets and posts to the effect of “APPLE LIED!!!1!1!! !” because they got hit with some low-volume uncommon fee. I’m not sure what causes a foreign transaction fee? When I’ve traveled (and it’s not been for a few years internationally), debit card and ATM usage only costs a few tenths of percent extra in the exchange rate. Alan Forkosh: I’ll be shocked if downloads don’t integrate with every major financial app. My guess is that the grace period will be “no interest until the following cycle” as per usual, otherwise there’s a small interest charge on charges made the 1st and paid the 31st. The statement that paying twice a month lowers interest payments indicates daily compounding, so my guess is that the grace period is until the same day the following month. MMTalker: I’m not going to prognosticate international rollout because the regulatory issues are 10x normal. Here Apple can bypass being regulated like a consumer bank by partnering with one; if that’s not true elsewhere (and I’m sure it isn’t in the EU), they’re going to be very slow to expand. And since I suspect that Apple is going to use an adjusted risk model, they’re going to want to test those assumptions with a year or two of data before expanding. Gastropod: Your credit rating is independent of interest paid, until it gets very high when it lowers your score. They want to see frequent charges that are paid off, and it certainly doesn’t hurt that you don’t carry any other debt. The kind of debt that improves your score is very large loans paid off monthly over time, i.e. a mortgage. Will M: any payment made at Apple is 3%, so non-Apple products at an Apple Store or non-Apple providers in the App Store all qualify. At least, if there are exceptions (i.e., for education stores) that’s not stated yet; OTOH, my educational storefront is the Penn Bookstore and that’s not Apple. Will close by saying: I wasn’t a financial journalist before this story, so while the story is fact-checked my comments are not, and I welcome corrections. Well, ‘privacy’ in that Apple doesn’t see the data, but Goldman Sachs does. To be honest, I’m much more comfortable with Apple having my data than Goldman Sachs. Exactly. I will never get an Apple Card until they use an ethical financial services provider. This Matthew Panzarino article is a useful ‘how it works’ piece. All a bit moot in Europe… the absence of Tap to Pay with the card will be a big disincentive on this side of the water. We have Apple Pay and Google Pay and young people do use it but Everybody taps. The main detail in this article that was depressing for us is that Apple Card is tied to an individual—there’s no way to get multiple cards for the same account. Tonya and I only ever do that to reduce the amount of accounting and mental overhead in dealing with multiple cards (I honestly hadn’t even considered the possibility that a credit card would ever not make that possible). Unlike folks who try to game the points and rewards systems, we don’t find dealing with credit cards amusing and we try to have as few as possible. So I’ll probably have to sign up for Apple Card to see how it works and be able to write about it, but it will have to be a truly unique experience for us to use it over any other card. Well, ‘privacy’ in that Apple doesn’t see the data, but Goldman Sachs does. At the 36 minute mark of the keynote the VP for Pay and the screen behind her says “Goldman Sachs will never share or sell your data to third parties for marketing” or advertising. Speaking of accounting, is there any indication if and how information will get out of Wallet and into MoneyDance/Quicken/etc.? Good questions, Alan. I have a third one: will the “monthly” invoice be mailed or will it just be a PDF that has to be printed? I pay my credit card bills by check so I’ll need an invoice stub I can mail in with the payment. If not via QIF, CSV, or OFX, then you may have to manually enter it. Of course that is what I do now immediately on making a credit card transaction, rather than using the sparse info included it the various download files. The main detail in this article that was depressing for us is that Apple Card is tied to an individual—there’s no way to get multiple cards for the same account. Perhaps that will be added at a latter date, Adam. First, let Apple get the initial bugs worked out then maybe they can add a form of Family Sharing. I’m not sure what causes a foreign transaction fee? When I’ve traveled (and it’s not been for a few years internationally), debit card and ATM usage only costs a few tenths of percent extra in the exchange rate. In my experience, the fee was supposedly to recover exchange rate costs. Foreign exchange fees are communicated as “to recover exchange rate costs” but they are also a huge money maker for both the card networks (Visa/Mastercard/Amex) and to a lesser extent the banks. In addition to shopping the most favorable exchange rate for the transaction, there is a 2.5% - 3% markup applied as a “convenience charge”. I think it’s reasonable for consumers to be divided as to the fairness of this. After all, it is much more convenient not to have to convert and carry foreign currency. But there are ways around this which the truly savvy consumers will use if they find that to be worth the time value of money relative to the savings. “No foreign exchange fee” cards do away with this convenience fee but still may shop the most favorable exchange rate for themselves, meaning you might be a few basis points above the best possible exchange rate, but save the 2.5% - 3% compared to a “normal” card. My experience is with Chase which is relatively fair in their application of conversion rates. My recent overseas charges show less than 15 cents per $100 of variation between the wholesale rates and the rates Chase used–very acceptable! Indeed - while Jeff noted that foreign exchange fees were “a few tenths of a percent extra in the exchange rate”, on a family trip to Europe that costs $3000 that would be $90. For people taking a couple such trips a year, it’s easy to understand why they might search out a card that has no foreign exchange fees like your examples from Chase. Um, no. That would be the case if it were 3%. “A few tenths of a % extra” as per Jeff means it’s likely ~$10 for a $3000 vacation. Ten bucks on a several thousand $ trip I find highly acceptable. I know that a conventional currency exchange would charge me a lot more for that exchange in cash. I can’t speak for anyone but myself, but I find $10 for that extra convenience perfectly reasonable if I’m spending $3k anyway on that vacation. Traditionally, US credit cards have charged a fee of 3% or so for any transaction conducted in a foreign currency. This is independent of the currency exchange rate which is usually very close to the neutral rate you’ll see in currency exchange apps and tables. By the way, most credit cards that I am familiar with use the rate promulgated by the card brand for the day; so that all Visa cards have the same rate; all Mastercards have the same rate, etc. In general, this is a better rate than you will find doing any cash exchange. A competitive feature of some credit cards is to drop the 3% charge. For example, among credit cards I am familiar with, the Amex Blue has the charge and the Chase Southwest Card has it. However the Chase British Airways card does not have it, and the Citibank Costco card dropped it recently. The Apple card will join the latter group. Traditionally, US credit cards have charged a fee of $3 or so for any transaction conducted in a foreign currency. I think you mean 3% or even higher. It’s not a flat rate. I used the wrong card buying a Eurail pass a few years ago. I did it online in the US before my trip and didn’t even think about it being a “foreign transaction” — my $400 payment got me charged an extra $46 for the foreign transaction fee. Yes, my mistake. It’s been so long since I switched to a ’no fee’ card when I travel that I messed up the explanation. I have edited the original response. You’re fully entitled to dislike Sachs, but at least be aware (as others have noted here already) that institutions this size are large and varied. Banks’ investment arms are typically isolated from their commercial banking operations (everyday business and consumer usage), and are often licensed separately. Essentially they share a company brand name, but the staff are very separate. After the ‘2008 economic event’, they also churned both policies (as govt imposed slightly tighter regulation) and people; the questionable ones have likely moved on to elsewhere anyway. AFAIU, it’s similar to most European banking. Here in London, banks are required to keep the businesses separate to avoid the possibility of risk spreading from the relatively more risky investment banking (typically including pensions, and OEIC’s/unit trusts, et al.). Certain of our banks had the same bad banking issues, but really, the world of banking is in many ways small enough that you can’t throw the baby out with the bathwater, as they’re very interlinked organisations. A company the size and type of Apple does its due diligence enough for customers to know they’re not going to jump into bed with some fly-by-night. And anyway, this is not your bank account, but a separate credit (i.e. debt) facility, so they can’t access your actual money. As in basis points, so 30% of 1% percent, you’d mean 30 basis points. (One for the economically trained people out there. Apple’s forthcoming Apple Card and updated Wallet app promise innovative features and consumer-friendly particulars. But Jeff Porten thinks Apple Card will have a farther-reaching impact. Really? Has this been proven with facts from the small print or elsewhere, as it sounds rather unlikely that Apple would remove iCloud services as an incentive to pay your credit card bill (partially or in full). Surely that’s rather a cross-contamination of services, that I’d find it rather likely that US authorities wouldn’t look kindly to such persecutory practices being allowable. Surely they’d just increase your interest rate, reduce your card limit, or cancel your card after repeated errors by the user. EDIT: Actually I just heard seconds ago on MacBreak Weekly, they’re not doing this, but rather the failed payment will simply appear on your credit file as “July: missed payment”, “August: missed payment”. So other credit facilities will end-up being affected, when those lenders see how bad you are at making payments. Gosh credit scoring/rating/files (depending on your country) is a minefield. If you pay everything in full and on time they don’t like you as they’re making no money in interest, conversely if you’re crap and have debts unpaid, they don’t like you either (they’re not getting paid back &/or bankruptcy-type things). No, what they want is someone who is kind-of in debt, but not so much they cannot make payments, and you continue to make them! Yes, such concerns are without any basis. Not going to be an issue or even close to it. Banks’ investment arms are typically isolated from their commercial banking operations (everyday business and consumer usage), and are often licensed separately. We USED to have laws regulating this… they are no longer… I hope you do realize we are in an age of the dismantling of any and all regulations that provide any protections for consumers (just look at who heads Treasury)… along with the air we breathe and the water we drink. As for the “card” it’s something very tightly integrated with their phone… I don’t have or need that kind of phone AND I would never,ever have any involvement with anything attached to Goldman, they are the true vultures of our day. I’ll repeat a comment I made on FB… “All your finances belong to us.” that! Regardless of the level of separation between the investment and retail sections, Goldman Sachs’s retail operation does not have an ethical policy as far as I can tell. I’m not willing to have my spending profit a bank that is then investing in industries and causes I don’t agree with. Given Apple’s ethical policies, I would have hoped they’d gone with a financial institution that had an ethical investment policy. Here is where Apple gets to exercise its power in an interesting way: miss a normal credit card payment and it costs you money, but miss an Apple Card payment and every Apple device you own might degrade in service. It’s very clearly written as speculation with “might” and “could.” I pushed back on it in editing too because it seemed extremely unlikely and legally problematic to me as well; this text was where we ended up. 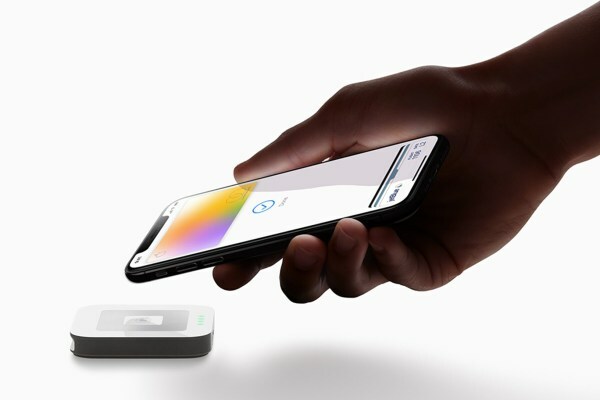 Obviously, there’s no way of knowing for sure what will be true until Apple Card actually becomes available, but the point to ponder is that Apple’s business is encompassing multiple industries, each with their own ongoing services and fees. Apple is working hard to tie things together on the user-facing side, so it’s not inconceivable there could be additional connections elsewhere in the business model. Gosh credit scoring/rating/files (depending on your country) is a minefield. If you pay everything in full and on time they don’t like you as they’re making no money in interest, conversely if your crap and have debts unpaid, they don’t like you either (they’re not getting paid back &/or bankruptcy-type things). No, what they want is someone who is kind-of in debt, but not so much they cannot make payments, and you continue to make them! Based on my experience, I believe that it is a myth that if you have no loan history and always pay your credits cards within the grace period (so, no interest), you are considered a bad credit risk. I have never owned a home, always paid cash for a car, and with the exception of misreading a statement every few years, always pay my credit card statement in full. I Have several credit cards with ridiculously high limits so that my utilization numbers are low. I do charge most non-trivial expenses, finding that I need to replenish cash less than once a month. Still, my credit rating is apparently in the 95th percentile. So, the credit companies make money from me on what they siphon off on purchases, not on direct charges (interest) to me. Apparently, they are happy with that, as I still get mumerous offers for no-fee cards. Yeah, I was being a bit tongue in cheek – a bit of a comic-book explanation of how cc companies see their users in a simplistic outsider-looking-in view! Thanks for those pointers to articles from The Points Guy, David Ross. I do wish the articles had publication dates though. They do. Centered under the article title. The oldest article was from November 3, 2018. But, yes, details can change a lot in a few months. My picking those over the few hundred other was they give an overview of how things work. For both groups, the interest rates and fees are predatory, and the obfuscation of how credit usage translates into increasing debt is very high. As someome who has been on the thin end of the asset and income spectrum at one point in my life here’s my take. If these issues apply to you DO NOT GET A CREDIT CARD. End of conversation. If you can’t pay the full balance every month, pay on time every month, and never exceed your limit, DO NOT GET A CREDIT CARD. That is all there is to it. Yes there are situations where a credit card will offer to spread out payments for 0%. But you MUST make every payment on time or you get back billed the full interest charge. The ability to create virtual card numbers is nothing new. With my Bank of America credit card I can create one-time numbers or numbers intended to be reused. I can specify how long the numbers are valid and I can set a dollar limit with them. Once used with a particular business, the numbers cannot be used with any other business. If the new Card has a magnetic stripe intended for use with old fashioned card readers, then it is no more secure than old fashioned credit cards. Sorry. I strongly feel I play the “game” [noun], but I do NOT “game” [verb] the system. I rarely cancel cards unless it is being replaced by a card I was offered. I follow the rules. Those who “game” [verb] the system tend to get their cards cancelled. And at times their entire business with a bank shut down. Based on my reading and overseas travel a few times a year and my daughter’s more extensive travels (around the world twice just because she could) the best way to avoid excess conversion fees is get cash out of ATMs i the local currency with no fee debit cards (Germany is real big on cash compared to most of the “first” world) and find a no foreign transaction fee card for credit purchases. And if it is contactless so much the better. In Germany a few months back the grocery stores would give me a total and then somewhat frown when I pulled out plastic then roll their eyes followed by a big sigh when they realized it wasn’t contactless and they had to actually get me to sign something. I believe that it is a myth that if you have no loan history and always pay your credits cards within the grace period (so, no interest), you are considered a bad credit risk. Total myth. As long as you use the card some reasonable amount they are more than happy to collect 1.5% to 4% of each transaction as profit after the expense of dealing with you. But banks do NOT like people with credit cards that are gathering dust. No, I mean privacy from store purchase tracking, the same way that Apple Pay stops that if you eschew loyalty cards. But not everyone takes Apple Pay, such as Kroger and their sub chains. With the Apple card, even if the number isn’t tokenized for each purchase (I’m not clear about that) I can frequently change the number outright to block the store from linking all of my purchases together, and the uber-companies linking those to all of my purchases elsewhere. It won’t help for online purchases because they have the shipping address to act as a key. But any lessening of data falling into the mill is a win. I too would rather have Apple have the data than Goldman (or any other bank), but at least it’s (probably) no worse than my current credit card, and might be somewhat better. And will sometimes auto-cancel them on you (I’ve had it happen, this isn’t just internet legend). While this may not seem bad (you’re not using the card after all), it can affect your credit score. First, it will decrease your total credit limit which will increase your usage percent (if you have a balance on any card). Second, if it’s an old card it may decrease the average life of your cards. Both of those things (usage and life) can affect your score. 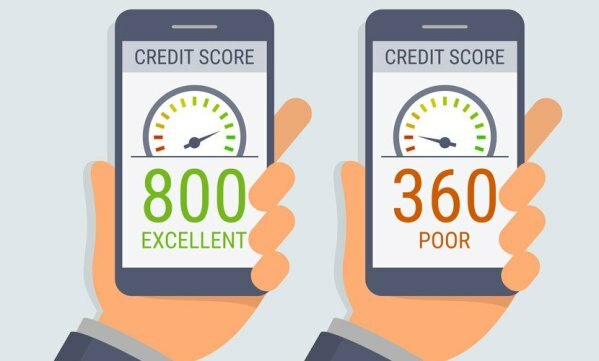 Of course if you have a high score and aren’t looking to get a loan any time soon, you may not care about the few percent drop in your credit score, but if you do, think about using every card once or twice a year or so. Chase just did this to me with a card I’ve had for nearly 20 years. I’ve only used it for balance transfers in recent years - but I HAVE used it. Yet I got a letter saying it was going to automatically cancel when it expired. It has a high credit limit so I didn’t want to lose it. The letter stated that using it after I received the letter would not change its status - I had to call them. Liberty did the same thing, except I had to use it to keep it. Guess this means I’m going to have to use the cards for little purchases now and then. The Citi/Costco Visa card gives 4% on gas, 3% on restaurants and travel, 2% on Costco purchases, and 1% on everything else, which would include purchases from Apple. I am assuming the Costo card is not a no fee card, as you have to pay for the membership fee. What is it currently? Yeah this is basically true, get the right card for the right job, is the basic rule. Checking each ones fee structures for your usage. So if you travel a lot, make sure you get cards for that; if you want to pay an expensive item off over time, then get a multi-month 0% interest rate purchases card and make sure you can clear the amount within those months, etc. Basically, cards are not specific to one use, each one has it’s own raison d’être, and when you’re done with one whose “good” function has ended, it’s often best to then close it, as its after that that companies then look to make money from you being tempted to use it for the wrong things that they can charge you for in some way. total is up to £30, you can either: chipNpin/contactless/ApplePay. total is over £30, you can either: chipNpin/ApplePay. The latter is typical, but some stores (for their own reasons?!) stop AP at £30 as well. The same is true in most other European countries, accept some have a different contactless limit, or none at all. Obviously, each store sets their own rules depending on their liability for covering fraudulent usage. But why policies on usage can’t be made more universal… who knows?! In reality, how does it affect you in having a company tracking your spending? Surely, all the store is going to do here is offer you things more relevant to you, like vouchers off, or maybe personal advertising in some way? And that’s presuming they issue those at the till, as unless you use a loyalty points card or something on top, they don’t have your address. AFAICT, cc companies only track your amounts, not who you spend it with, (I’ve never had any offers concerning what I buy or should buy from my cc companies that I can remember, ever). At least here in Europe, under regs like GDPR, neither stores nor cc companies are allowed to sell-on your data to third-parties, so that’s a dead end for them. Data security for theft is important (card skimming, et al. ), but outside of that, companies knowing you spend x amount in their stores on y products, AFAICT really shouldn’t affect you outside of not being tempted by any ‘discount offers’ they may try to offer you that fall outside of what you want to spend. And that’s down to personal responsibility to not spend. (1) Card skimming and the tokenisation on each charge. (2) Ease and ubiquity of usage (I want to be carrying ZERO plastic sometime in future, including beyond payment cards —travel/loyalty/etc. cards— so unless enthusiasts bother to use these things now, it’ll take longer to get there ;-). The Citi/Costco Visa is a no-fee card. It’s true that you have to be a Costco member to get it, but you pay the same Costco membership fee whether you get the Visa card or not. The Costco card also serves as your Costco membership card, so it has your picture on the back. That could be useful when you need to show a picture id but don’t want to show a driver’s license or other government id. The reward redemption process is a bit odd. The total amount available is shown with the February statement. You can only redeem it at the checkout of a Costco store. If you don’t use it for purchases at that Costco, you will be given the reward in cash. Sorry. I strongly feel I play the “game” [noun], but I do NOT “game” [verb] the system. My apologies—all I meant was that all the points and rewards are just that, a game, and not part of a general personal finance strategy. Presumably you find it amusing and sufficiently rewarding to play that game, but I’ve always seen it as a lot of work and risk. Of course, I’m categorically allergic to all forms of gambling too because of the money involved. I agree. I have 3 credit cards and I only intended to have 2. A Chase card to get 5% off of Amazon purchases. My bank’s card which giver me an extra 10% rebate on top of the regular cash rebate (rebate amount varies by type of purchase), and a Target credit card which started as a Target only card and became a MC which gets me a 5% discount at Target and regular rebates elsewhere. All are no fee cards (if they charged me a fee I would drip them). An important component of a credit rating is the age of your accounts. If you drop a 10 year old credit card account and replace it with a new one your credit rating will go down. So keeping old accounts is a good idea. I am interested in the Apple Card, though I don’t really want a 4th card. Not for the discount for Apple goods (I buy iTunes cards at 10+% discount on a regular basis from other stores) but for privacy, security, and the 2% discount when I use ApplePay. But I will have to pay attention if another card will give me a bigger discount in any situation. The Apple Card would not replace any of my other cards since they would give me larger discounts most of the time. The Apple Card would get most of its use at Trader Joes, Victory Comics and CVS. That’s perfectly fair enough. I’m exactly the same on most of these points/cashback/store loyalty schemes. All cashback/points/loyalty systems are essentially trying to achieve, is to get you to spend money, and in doing so they get transaction fees at the most simple level, and further fees (interest, missed payments, etc.) 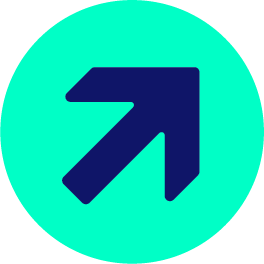 at a deeper level – so the more throughput they can get, the more money they earn. Importantly from a personal perspective, they all require work to keep ahead of, and that requires time and effort on some level as a user. Busy people don’t want to spend their free time dealing with all these “deals”, “offers”, and paying this card off before that one, or within a certain timeframe or you lose out on said “deal” in the first place. Sometimes just earning a living, taking simple affordable finance when required, and spending within your means, equals a happier life. Agreed. If you don’t want to put in the time then don’t go for points and miles. But I’m sitting on about $15,000 in value in my current points and miles acounts. Cost me under $3000 in fees. I just spent 2 nights in Florida using a free night certificate plus some points. I’ll be spending 7 nights in London this June at an upper level hotel, all on points. My daughter has been around the world twice (there were destinations and it was just easier to do it that way), taken a shower in a private suite over Europe in the nose of an A380, spent 5 nights in Japan with business/first class air fare both ways with travel costs of less than $400 and more. She and her hustband have had 2 for 1 status with Southwest for well over a year. If you want to travel it can be a way to do it with a lot fewer $. Yes it will cost some time but the $ savings can be huge. None needed. I just wanted to clarify. There ARE people who “game” [verb] the system and they tend to lose their credit cards. Not Meeee. Collapsing all the notes about Costco. They sell Apple gear at a discount. Not much but more than the Apple store for most people. They sell iTunes gift cards $100 for $95 every day. Periodically they go down to $100 cards for $85. So a 15% discounts plus an additional 2% at the end of the year. And the Costco Citi Visa warranty extension is also for purchases NOT at Costco. In general Citi cards with $400+ annual fees offer similar warranty extensions but this one has no fees. And as far as I know all the other cards with warranty extensions only cover you up to 1 additional year. Surely, all the store is going to do here is offer you things more relevant to you, like vouchers off, or maybe personal advertising in some way? In the US, there are basically no regulations barring data collection or how that data can be used. "Some of the categories are innocuous — pet owner, or winter sports enthusiast. they all require work to keep ahead of, and that requires time and effort on some level as a user. Busy people don’t want to spend their free time dealing with all these “deals”, “offers”, and paying this card off before that one, or within a certain timeframe or you lose out on said “deal” in the first place. Hey, I don’t think that is quite fair. There are many no fee bank credit cards that offer a % back on purchases. If you don’t want to mess around with which one gives which % on which purchase, you still benefit from just using a points giving card for day to day purchases. With essentially no effort you get a benefit you can use to pay your credit card bill. Of course, it’s always prudent to pay you bill by the due date. After all, you are getting free access to money, and a bonus % just for doing so. This doesn’t require spending any time figuring out which card to pay first. One reasonable resource for sorting this out might be nerdwallet.com. They all do various financial related products (cc’s / banks ac’s / insurance / loans / etc. ), and then there’s the many others for everything from cheapest supermarket brand comparisons (mysupermarket.co.uk), to the plethora of travel sites/apps (Trivago.co.uk / Skyscanner.net / Kayak.co.uk / Momondo.co.uk / Travelsupermarket.com / Expedia.co.uk / Ebookers.com / etc. – many of these are international, obviously)… you get the idea, lol!